Maryi Barahona rejoins G-Volution after returning from Panama! Welcome back, Maryi! G-Volution is working on a handful of "still- secret projects"....but don't worry, we'll tell ya soon! Assistant Director of G-Volution, Leslea Clark, started an online network for New Jersey Dancers! AND, a group for G-Volution Fans! Inspired by Leslea, Graziella followed her lead and created Dance New York, the sister- network for all who love dance in New York! Graziella Baratta, director/choreographer of G-Volution was crowned Ms. United States 2008! Our awesome logo T-Shirts were created and sponsored by Untuckable.com! Untuckable is a brand- new apparel company that not only designs one of a kind T-shirts, but other merchandise as well. You can even create your own design, and get a portion of the profits if they sell it! See How we Rocked New York that day! 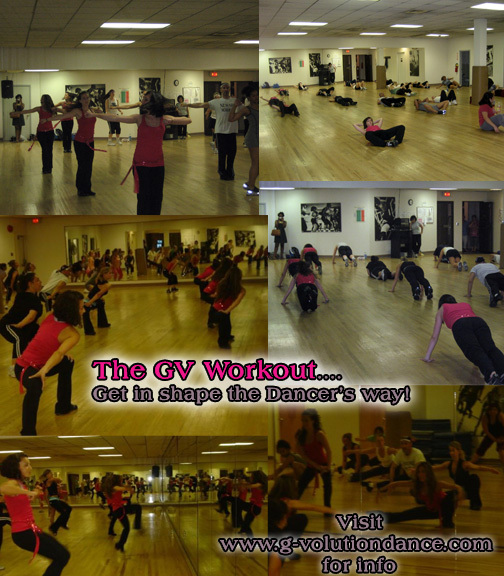 Read the G-Blog for details on GV Workout. Read the G-Blog for details on this event! G-Volution had their first photo shoot with David K ...see our photos page, including all major pics on each page for David's awesome work!